Joe and I are long time New Englanders but moved to Florida in 2002 to enjoy more year round warm weather. We are both ‘water people’ and so naturally gravitate to the ocean. We live on Anna Maria Island in Florida and enjoy an active life style. Our family is scattered — three children and nine grandchildren and seven great grandchildren — so some of our travels are to visit them. I spend about three months every year in St.Lucia to keep the houses (ours and the others we rent) in tip top shape and then love to travel to other spots as well. 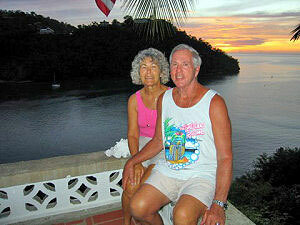 We spent our honeymoon in St.Croix and every year after that, we would choose and visit another Caribbean Island. Many islands later we found our way to the lower part of the Caribbean and decided this was ‘our kind of place’. It was more relaxed, a more mixed group of tourists from all over the world and very friendly people. One year we picked St.Lucia and had already decided to buy something somewhere in this general region. We fell in love instantly and after looking in different areas of the island we decided on Marigot Bay where we ended up finding a perfect house for us — and I hope, for you – simple, Caribbean style, light and bright! This was over thirty years ago. One of the reasons we chose to buy on this island was that so much is offered to the tourist, the Lucians are friendly and open their arms to you. There is so much grown on the island in the way of fruits and vegetables. You can just totally relax your whole trip at the house or beach. Or you can zip line in the rain forest, hike the Pitons, take a mud bath, tour botanical gardens, tour the Castries market, hike on Pigeon Point — the list could go on and on! And where Marigot is located about halfway down the western coast, it is easy to reach everything this wonderful island has to offer. Over the years, owners of homes near ours asked if we would help them find tenants and so the business has evolved to renting not only our own home, Poinsettia House — but also a home directly in back of us, Hibiscus Cottage –and two others in back of that, Flamboyant and Orchid houses. Come and visit and enjoy!